Are you ready to have some serious fun with spiral peyote? Cellini spiral, named after a famed 16th century Italian artist of dubious reputation and immense talent, is one of my favorite ways to take what would otherwise be a plain spiral peyote rope and turn it into something full of color and texture. The basic technique for making a Cellini spiral is the same as creating a piece of tubular peyote stitch: pick up an odd number of beads, tie them in a ring, and start working in tubular peyote stitch. What gives Cellini spiral it's characteristic undulation is the variation in bead sizes used to make the tube. It's really that simple! Cellini spiral can be worked in either even- or odd-count tubular peyote stitch. If you decide to use even-count tubular peyote stitch, don't forget to make the step-up at the end of each round. When working in odd-count peyote stitch, the work will just spiral around to infinity, with no need to make a step-up. Your tension will dictate which kinds of beading thread you should use for your peyote stitch Cellini spirals. If you normally bead with a very tight tension, you'll want to stick with a softer, nylon beading thread like Nymo or One-G. For a sturdier, tighter weave, try using Fireline or another kind of braided/bonded fishing line-type beading thread to help give your beadwork more structure. Pay attention to your tension when working a Cellini spiral. Beading too tightly will result in broken beads and snapped thread when you try to get your finished spiral to curve into a bracelet or necklace. Tension that is too loose will result in a piece of tubular peyote that lacks texture and definition. My best tip for working a Cellini spiral is to make at least one sample piece before you start your spiral so that you can see how your tension, bead sizes, and bead colors will all interact in your finished piece. Ready to give it a try? Here are four easy variations of Cellini peyote spiral for you to play with! Just when you think you've seen it all when it comes to stitching with peyote stitch, there's Melinda Barta's essential book, Mastering Peyote Stitch. With 15 gorgeous peyote stitch beading projects from some of our favorite bead artists like Jean Campbell, Lisa Kan, Sherry Serafini, and Jean Power, you'll be delighted with the diversity of techniques and materials that you can use to create stunning peyote stitch beaded jewelry. 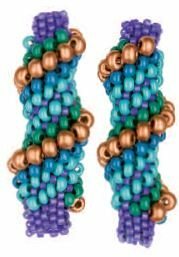 While you're getting your own copy of Mastering Peyote Stitch by Melinda Barta, why not treat yourself to a bead kit for one of the book projects — try the Big Sky Bracelet, designed by Melinda Barta! 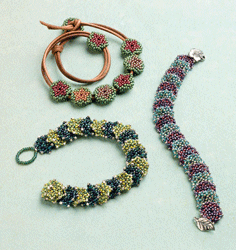 It's easy when you get your complete bead kit to go with your copy of Mastering Beadwork! Have you tried Cellini spiral yet? Leave a comment here on the Beading Daily blog and share your favorite tips and bead combinations for creating a stunning peyote spiral!